Area 232 is located on the southeastern fringe of the innermost part of the temple precinct. It is also referred to as Army Camp since it formerly housed an Egyptian military stronghold. 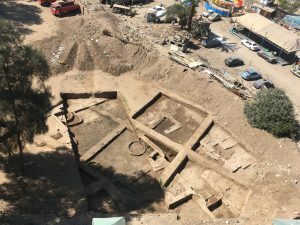 After the army left the area in 2015, its archaeological examination began in the autumn of the same year. Based on PETRIE’s plan of the temple, the discovery of the mud-brick enclosure wall of the so-called “High Sand” was expected. The excavation of the area soon showed vast layers of industrial soil and elements of domestic mud-brick architecture. 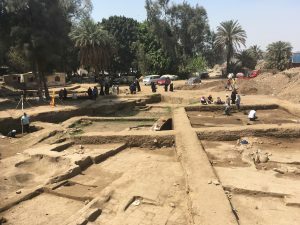 A workshop area of the 4th – 2nd century BC was discovered. Field work focused on the stratigraphical sequence of the area. So far, three different strata can be distinguished: several layers of debris were identified as stratum A. Below, stratum B showed different components of mud-brick architecture: many broad walls – up to one meter wide – could eventually be identified as the foundations of minor variants of the contemporary tower houses, initially carrying the weight of the upper floors. Furthermore, the domestic area had open courtyards and several round mud-brick structures of varying diameter, which probably served as silos. The layout of the southern trench resembles that of a building with the same kind of broad walls framing an inner room. Inside this room, three tiny furnaces – two built of mud-bricks and one outlined with pottery sherds – were observed. Their original use is not yet clear. Furthermore, a stone paved pathway in the northeastern precinct of the site belongs to the stratum and provides evidence for the reuse of limestone slabs, which initially may have belonged to the temple precinct or its necropolis. Thanks to Hans-Christoph NOESKE’s numismatical dating of coins, stratum B can be dated to the 2nd century BC. The excavation of this mid-Ptolemaic stratum produced many remarkable finds, such as two bronze statues of the god Harpocrates, a wooden scribal palette adorned with a hieroglyphic new-year’s inscription and various faience amulets. A well preserved limestone staircase marks an intermediate phase between stratum B and the underlying stratum C. The need for a staircase shows how fast the level of the area rose. It was constructed in stratum C, which dates back to the 4th century BC. Stratum C contained several layers of ash and charcoal, which covered the complete excavation area. This points towards a long-term industrial use of the area. Since the dark black layers included vast amounts of faience slag, the precinct may have served as the production site of faience objects, too. The innumerable fragments of roughly worked, roundish pottery trays, which probably were used for food preparations or even belonged to a bakery, were comparable indicators of the industrial demands of the area. The stratigraphical relation of a big limestone basin in the northern trench still remains unclear. Its shallow rims were built up with shattered pieces of former temple reliefs, partially dating to the Middle and New Kingdom. The monolithic basin may also have experienced this kind of reuse. In 1903-1904, when the Missione Archeologica Italiana was excavating an area close to the army camp. Ernesto SCHIAPARELLI discovered broad mudbrick walls that he later interpretated as belonging to some kind of rampart. 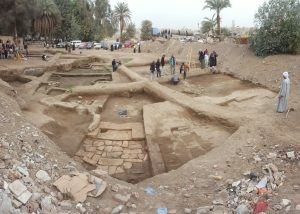 Many noteworthy finds were discovered within these hardly understandable structures, e.g. the fragments of the naos of king Djoser (2690/2640 – 2670/2620). 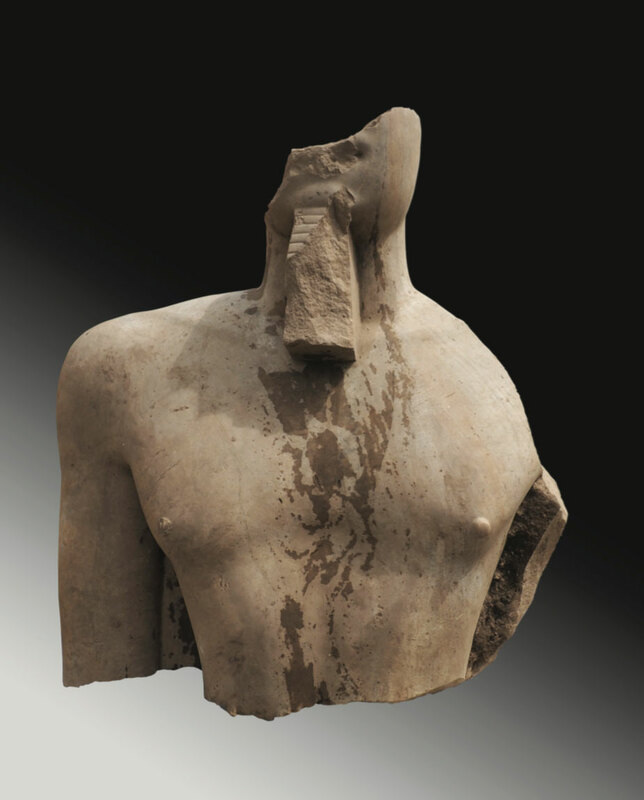 The majority of the objects, nowadays displayed in the Egyptian Museum of Turin, were shattered into small fragments. It is probable that SCHIAPARELLI was working in the same archaeological sequences that were recorded in area 232, could therefore be identified as various strata of domestic buildings and industrial workshops throughout different periods of reusing former temple inventory. Our cooperation with the Museo Egizio in Turin and the University of Pisa will shed new light on the finds and archives from the Missione Archeologica Italiana. The project is funded by the Gerda Henkel Stiftung.